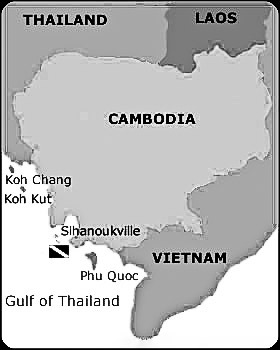 There are two main diving areas in Cambodia, the well developed Sihanoukville, and the less known Koh Kong. There are a number off offshore islands that are easily accessible, and where virgin dive sites are still being discovered. Journeys out are often brightened by encounters with dolphins and sea eagles. Cambodia is largely unknown as a scuba diving destination however it can offer some pleasant surprises in its waters. With such a short coastline and one major resort town it stands to reason that all of Cambodia's diving is done from Sihanoukville. There are a number diving areas from inner islands to outer islands, reefs and rocky outcrops. Underwater terrain and marine life is comparable to the Gulf of Thailand but with the distinct advantage of not having previously been dived thousands of times. Local operators are still discovering new dive sites and the waters of Cambodia are true virgin scuba territory. Take into consideration that not so long ago (and still in some places) fishermen fished with dinamite. That means that the closest dive sites might lack fish life.